Who says that a Caution Wet Floor Cone has to be used solely in instances where there’s a wet floor? One Selfridges security guard clearly didn’t get the memo, because today he’s being hailed as a hero for trying to thwart a smash-and-grab robbery with nothing but a cone in his hand. If all of this sounds a little absurd, that’s because it kind of is. 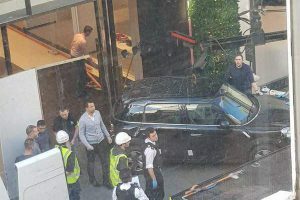 In London, an armed gang used a VW Golf and a Mini Cooper to smash into the luxury department store. While they still managed to steal designer handbags estimated to cost in the tens of thousands of pounds, little did they know, a security guard was there to single-handedly keep them at bay. CCTV footage shows the guard running towards the Golf wielding the cone in an attempt to “scare off” the raiders. He was eventually forced to dive out of the way as the car veered towards him. Although clipped by the bumper, he thankfully didn’t sustain any serious injuries. For those of us who aren’t planning on fighting off armed robbers, there’s still tons of use in owning a floor cone. Floor cones help people avoid wet spots and therefore keep them safe from slips and falls. With the winter months and subsequent snow filled days ahead of us, now is a great time to prepare for slippery floors.